Infant baptism is the practice of baptising infants or young children. In theological discussions, the practice is sometimes referred to as paedobaptism or pedobaptism from the Greek pais meaning "child". The practice is sometimes contrasted with what is called "believer's baptism", or credobaptism, from the Latin word credo meaning "I believe", which is the religious practice of baptising only individuals who personally confess faith in Jesus, therefore excluding underage children. Infant baptism is also called christening by some faith traditions. Most Christians belong to denominations that practice infant baptism. Denominational families that practise infant baptism include Catholics, Eastern and Oriental Orthodox, Anglicans, Lutherans, Presbyterians and other Reformed denominations, Methodists and some Nazarenes, and the Moravian Church. Scholars disagree on the date when infant baptism was first practiced. Some believe that 1st-century Christians did not practice it, noting the lack of any explicit evidence of paedobaptism. Others, noting the lack of any explicit evidence of exclusion of paedobaptism, believe that they did, understanding biblical references to individuals "and [her] household" being baptised (Acts 16:15, Acts 16:31–33, 1 Corinthians 1:16) as well as "the promise to you and your children" (Acts 2:39) as including small children and infants. The earliest extra-biblical directions for baptism, which occur in the Didache (c. 100), are taken to be about baptism of adults, since they require fasting by the person to be baptised. However, inscriptions dating back to the 2nd century which refer to young children as "children of God" may indicate that Christians customarily baptised infants too. The earliest reference to infant baptism was by Irenaeus (c. 130–202) in his work Against Heresies. Due to its reference to Eleutherus as the current bishop of Rome, the work is usually dated c. 180. Irenaeus speaks of children and infants being "born again to God." This reference has been described as "obscure." Three passages by Origen (185–c. 254) mention infant baptism as traditional and customary. While Tertullian writing c. 198–203 advises the postponement of baptism of little children and the unmarried, he mentions that it was customary to baptise infants, with sponsors speaking on their behalf. 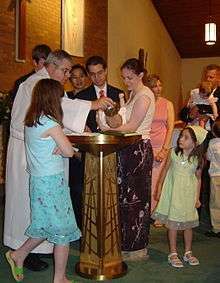 The Apostolic Tradition, sometimes attributed to Hippolytus of Rome (died 235), describes how to perform the ceremony of baptism; it states that children were baptised first, and if any of them could not answer for themselves, their parents or someone else from their family was to answer for them. The Eastern Orthodox Church, Oriental Orthodoxy and the Assyrian Church of the East also insist on the need to have infants baptised as soon as is practicable after birth. For them too baptism is not merely a symbol but actually conveys grace. Baptism is a sacrament because it is an "instrument" instituted by Jesus Christ to impart grace to its recipients. Infants are traditionally baptised on the eighth day, recalling the biblical injunction to circumcise on the eighth day. However, this is not mandatory. In many of these churches, the Sacred Mystery of Chrismation (Confirmation) is administered by the priest immediately after baptism. Holy Communion, in the form of consecrated wine and bread, is also given to infants after they are baptised. For them baptism is a "means of grace" through which God creates and strengthens "saving faith"  as the "washing of regeneration" (Titus 3:5) in which infants and adults are reborn (John 3:3–7): "baptismal regeneration". Since the creation of faith is exclusively God's work, it does not depend on the actions of the one baptised, whether infant or adult. Even though baptised infants cannot articulate that faith, Lutherans believe that it is present all the same. Because it is faith alone that receives these divine gifts, Lutherans confess that baptism "works forgiveness of sins, delivers from death and the devil, and gives eternal salvation to all who believe this, as the words and promises of God declare". In the special section on infant baptism in his Large Catechism Luther argues that infant baptism is God-pleasing because persons so baptised were reborn and sanctified by the Holy Spirit. Presbyterian and Reformed Christians believe that baptism, whether of infants or adults, is a "sign and seal of the covenant of grace", and that baptism admits the party baptised into the visible church. Being a member of the visible church does not guarantee salvation; though it does provide the child with many benefits, including that of one's particular congregation consenting to assist in the raising of that child in "the way he should go, (so that) when he is old he will not turn from it". Elect infants (those predestined for salvation) who die in infancy are by faith considered regenerate on the basis of God's covenant promises in the covenant of grace. Presbyterian and many Reformed Christians see infant baptism as the New Testament form of circumcision in the Jewish covenant (Joshua 24:15). Circumcision did not create faith in the 8-day-old Jewish boy. It merely marked him as a member of God's covenant people Israel. Likewise, baptism doesn’t create faith; it is a sign of membership in the visible covenant community. Presbyterian and Reformed Christians consider children of professing Christians to be members of the visible Church (the covenant community). They also consider them to be full members of the local congregation where their parents are members and members of the universal Church (the set of all true believers who make up the invisible church) unless and until they prove otherwise. Baptism is the mark of membership in the covenant of grace and in the universal church, although regeneration is not inseparably connected with baptism. The disagreement about infant baptism is grounded in differing theological views at a more basic level. Christians disagree about infant baptism because they disagree about the nature of faith, the role of baptism, the means of salvation, the nature of grace, and the function of the sacraments. Pedobaptism and credobaptism are positions which bubble up from theological views at a more fundamental level of one's theological system. Presbyterian and Reformed Christians base their case for infant baptism on Covenant theology. Covenant theology is a broad interpretative framework used to understand the Bible. Reformed Baptists are in many ways Reformed yet, as their name suggests, adhere to Believers Baptism. Paedobaptists challenge credobaptists on this point: Why would a whole household be baptised just because the head of the house had faith? Shouldn’t they baptise each member of the family as they come to individual faith? Household baptism implies that the rules for membership in Abraham's covenant have continued into the New Testament, the main difference is the sign of the covenant. Credobaptists would admit that infants are in need of salvation but paedobaptists push the point a step further by arguing that it makes no theological sense for infants to need salvation but for God to make no provision for them to be saved (See 1 Cor 7:14 where Paul says that the children of a believer are holy—separated—and therefore, perhaps, would not need baptising even if baptism saved). Some Credobaptists who agree to the Psalm 51 interpretation, argue that even though infants are sinful they are not accountable, because of the "age of accountability". Although many theologians would argue that an "age of accountability" is nowhere mentioned in the Bible. Another Credobaptist position is called predispositionalism. This suggests that baptism is only a mature response to eternal life, and that infants generate their inner response to God's presence, i.e. those who warm to him would, if dying in infancy, be with him eternally; contra-wise those who chilled to him. This aligns to the idea of individual faith/welcome (Jhn.1:14). Its point of determinism predates the age of evangelism, which it holds is still valid in crystallising predisposition into maturing faith in this life. It considers shades of meaning in the keyword salvation. Other approaches to death in infancy are in John Sander's No Other Name, and include postmortem evangelism. Several early Church Fathers seem to have taught that infant baptism is proper; Origen states that the practice of baptising infants is of apostolic origin. Infants can not outwardly express faith. Some opponents of paedobaptism point out that Jesus himself was baptised at the age of 30. They also point to the two (out of five) Great Commission passages that speak of baptism. They see Matthew 28:18–20 as giving exclusive instructions about who is to be baptised: "Go therefore and make disciples of all nations, baptizing them in the name of the Father and of the Son and of the Holy Spirit, teaching them to observe all things that I have commanded you" (verses 19–20, NKJV). They interpret this as referring to three successive stages, with baptism following on becoming a disciple (which is beyond the power of an infant), and instruction following on baptism, not preceding it. The Mark 16:15–18 Great Commission passage speaks of believing: "He who believes and is baptised will be saved; but he who does not believe will be condemned" (verse 16, NKJV). This, they say, excludes infants, whom they see as incapable of believing. If pedobaptists accept this text as canonical, they can still point out that the second clause mentions believing, but not baptism. Therefore, one could be baptised and still not be a believer. They argue that this may not exclude infant baptism, but rather corroborate it, since it indicates that one baptised as an infant who rejects the faith is not saved against their will. Pedobaptists who accept this passage may also point out that although belief and baptism are both mentioned, there is no order implied. In return, opposers declare that baptism is for those who already believe and are able to state their belief, which infants cannot do. In Peter's address to adults, "Repent and be baptised" Acts 2:38, they see repentance as a prerequisite, and this requires a mature understanding of sin and a decision to turn away from sin. However, St. Peter was speaking to those who were already adults, not to infants. Pedobaptists claim that it would follow that his instructions are meant for adults and not for infants. Indeed, adult candidates for baptism are required by most branches that practice pedobaptism to make a confession of faith before baptism. Some point to Deuteronomy 24:16 or 1 Peter 3:21 as evidence that each individual must make a mature decision regarding baptism. See Believer's Baptism. Some oppose baptism of children as ostensibly incorporating them into the church without their own consent. This, however does not absolve the responsibility of biblical parents to raise their children in the training and admonition of the Lord within the cultural context of the church. Trinitarian Christian denominations that oppose infant baptism include the Assemblies of God, Association of Vineyard Churches, Christian and Missionary Alliance, Church of God (Cleveland, Tennessee), Calvary Chapel, Community Churches, all Baptist denominations and including Independent Baptists, Gnostic Churches, the groups which originated out of the Restoration Movement (Churches of Christ, Christian Church (Disciples of Christ), and Christian Churches/Churches of Christ), as well as other nondenominational churches, International Churches of Christ, International Christian Church, Foursquare Gospel Church. Church of God in Christ, Church of God of Prophecy, Anabaptists (such as the Church of the Brethren, Mennonite, and Amish), Schwarzenau Brethren/German Baptists, the Seventh-day Adventist Church, some Methodists, and most Pentecostal denominations. Several nontrinitarian religious groups also oppose infant baptism, including Oneness Pentecostals, Christadelphians, Jehovah's Witnesses, United Church of God, The Church of Jesus Christ of Latter-day Saints and the Community of Christ. Within The Church of Jesus Christ of Latter-day Saints, confirmation or "the laying on of hands" is an essential part of the baptismal ordinance, and to receive baptism without confirmation is to leave the ordinance incomplete. Confirmation is the conferring of the gift of the Holy Ghost as a constant companion. To confirm means to “make more sure” and the ordinance of confirmation stands as a witness of the individual becoming a member of the LDS Church and not just an acceptance of Jesus. ↑ "The art of baptism shall only be preformed on a infant whom has been born in a foreign country if the infant stays in the United States of America for one year at least after the baptism. A. None, they are just different words for the same thing.". Church of England. Retrieved 8 June 2007. ↑ "Can I have my infant christened?". United Methodist Church. Retrieved 8 June 2007. Christening is not a separate or different service. It is the same thing as baptism. ↑ "Chapter 7, "Concerning Baptism." ↑ The 1980 Instruction of the Congregation for the Doctrine of the Faith states that "Many inscriptions from as early as the second century give little children the title of 'children of God', a title given only to the baptised, or explicitly mention that they were baptised: cf., for example, Corpus Inscriptionum Graecarum, 9727, 9801, 9817; E. Diehl, Inscriptiones Latinae Christianae Veteres (Berlin 1961), nos. 1523(3), 4429A." ↑ Schaff, Philip (2001) [c. 1885] "Introductory Note to Irenæus Against Heresies", Ante-Nicene Fathers, Volume I, Against Heresies, William B. Eerdmans Publishing Company. ↑ "For He came to save all through means of Himself—all, I say, who through Him are born again to God—infants, and children, and boys, and youths, and old men. He therefore passed through every age, becoming an infant for infants, thus sanctifying infants; a child for children, thus sanctifying those who are of this age, being at the same time made to them an example of piety, righteousness, and submission; a youth for youths, becoming an example to youths, and thus sanctifying them for the Lord. So likewise He was an old man for old men, that He might be a perfect Master for all, not merely as respects the setting forth of the truth, but also as regards age, sanctifying at the same time the aged also, and becoming an example to them likewise. Then, at last, He came on to death itself, that He might be “the first-born from the dead, that in all things He might have the pre-eminence,” the Prince of life, existing before all, and going before all." Irenaeus of Lyons. (1885). Irenæus against Heresies. In A. Roberts, J. Donaldson, & A. C. Coxe (Eds. ), The Ante-Nicene Fathers: The Apostolic Fathers with Justin Martyr and Irenaeus (Vol. 1, p. 391). Buffalo, NY: Christian Literature Company. ↑ The three passages identified by scholars are Homilies on Leviticus 8.3.11; Commentary on Romans 5.9; and Homily on Luke 14.5. They are mentioned, for instance, in the following sites: 1, 2, 3 4, 5, 6 and, of course, in the sites that give the full texts of Origen on Leviticus and Luke. ↑ The first passage cited has: "Baptism according to the practice of the Church is given even to infants"; the second has: "The Church had a tradition from the Apostles, to give baptism even to infants"; the third has: "Infants are baptised for the remission of sins . . . That is the reason why infants too are baptised". ↑ "The delay of baptism is preferable; principally, however, in the case of little children. For why is it necessary . . . that the sponsors likewise should be thrust into danger? . . . For no less cause must the unwedded also be deferred—in whom the ground of temptation is prepared, alike in such as never were wedded by means of their maturity, and in the widowed by means of their freedom—until they either marry, or else be more fully strengthened for continence" ( 18). ↑ "The children shall be baptised first. All of the children who can answer for themselves, let them answer. If there are any children who cannot answer for themselves, let their parents answer for them, or someone else from their family. After this, the men will be baptised. Finally, the women" (The Apostolic Tradition of Hippolytus of Rome 21.4–5). ↑ White, BR, Handbook to Christian Belief, Eerdman's, p. 443 . ↑ Code of Canon Law, canon 867. ↑ "The sheer gratuitousness of the grace of salvation is particularly manifest in infant Baptism" (Catechism of the Catholic Church, 1250). ↑ John Henry Parker; et al. (1844). "The Epistles of S. Cyprian, with the Council of Carthage, on the Baptism". Oxford, London. Retrieved 12 December 2014. ↑ Ware, Bishop Kallistos (Timothy) (1964). "The Orthodox Church". New York: Penguin Books: 284. 1 2 3 "Sacrament of Holy Baptism – Circumcision". WELS Topical Q&A. Wisconsin Evangelical Lutheran Synod. Retrieved 29 Jan 2015. ↑ "Infant Baptism". WELS Topical Q&A. Wisconsin Evangelical Lutheran Synod. Retrieved 29 Jan 2015. In baptism, however, we do not do something for God, rather he does something for us and in us. He works to either create or to strengthen faith. It is true that neither baptism nor the proclamation of the gospel will benefit anyone apart from faith. However, through the proclamation of the gospel and through baptism the Holy Spirit works faith. The means of grace have the power to create the faith they require. ↑ See "Baptism and Its Purpose"
↑ See "Luther's Small Catechism"
↑ See "Luther's Large Catechism" subsection "Of Infant Baptism"
↑ "Assessing John Wesley's View of Baptism with reference to The Quadrilateral". 2002. Retrieved 2011-03-17. ↑ Westminster Confession of Faith, Chapter 28, Section 1. ↑ Westminster Confession of Faith, Chapter 10, Section 3. ↑ Westminster Confession, Chapter 28, Section 1 and especially section 3. Baptised infants and adults are considered part of the covenant of grace by faith unless they prove otherwise by committing apostasy. ↑ "If baptism was demanded of the Jews as a prerequisite of church membership, we may reasonably conclude that the Gentiles were not admitted to the privilege except on the same condition" (Baptism a Condition of Church Membership). ↑ "When an infant is baptised God creates faith in the heart of that infant. This faith cannot yet, of course, be expressed or articulated, yet it is real and present all the same (see e.g., Acts 2:38–39; Titus 3:5–6; Matt. 18:6; Luke 1:15; 2 Tim. 3:15)" (The Lutheran Church, Missouri Synod). ↑ Galatians 3:6–9 & Galatians 3:26–29; Romans 11.17–24; Rom. 4:16; Eph. 2:11–13; Eph. 3:3–6; Rom 2:28–29; 1 Peter 2:9; Gal. 6:16; Phil 3:2–3). ↑ Did Peter Authorize Infant Baptism? ↑ "The Church received from the apostles the tradition of giving baptism even to infants" (Commentaries on Romans 5:9, quoted, for instance, in W. A. Jurgens, The Faith of the Early Fathers (Liturgical Press 1970 ISBN 9780814604328), vol. 1, p. 209). 1 2 Norman, Keith E. (1992). "Infant Baptism". In Ludlow, Daniel H. Encyclopedia of Mormonism. New York: Macmillan Publishing. pp. 682–683. ISBN 0-02-879602-0. OCLC 24502140. ↑ Eerdman's Handbook to Christian Belief, William B. Eerdman's Publishing Company, 1982. ↑ Merrill, Byron R. (1992). "Original sin". In Ludlow, Daniel H. Encyclopedia of Mormonism. New York: Macmillan Publishing. pp. 1052–1053. ISBN 0-02-879602-0. OCLC 24502140. ↑ Rudd, Calvin P. (1992). "Children: Salvation of Children". In Ludlow, Daniel H. Encyclopedia of Mormonism. New York: Macmillan Publishing. pp. 268–269. ISBN 0-02-879602-0. OCLC 24502140. ↑ Hawkins, Carl S. (1992). "Baptism". In Ludlow, Daniel H. Encyclopedia of Mormonism. New York: Macmillan Publishing. pp. 92–94. ISBN 0-02-879602-0. OCLC 24502140. ↑ Warner, C. Terry (1992). "Accountability". In Ludlow, Daniel H. Encyclopedia of Mormonism. New York: Macmillan Publishing. p. 13. ISBN 0-02-879602-0. OCLC 24502140. ↑ cf. article entitled Redonner tout son sens à l'initiation chrétienne : un défi à relever in Lumière et Vie 270 (June 2006), proposing the establishment of as many as seven such occasions. 1 2 Craven, Rulon G. (1992). "Confirmation". In Ludlow, Daniel H. Encyclopedia of Mormonism. New York: Macmillan Publishing. pp. 310–311. ISBN 0-02-879602-0. OCLC 24502140. ↑ Porter, Bruce Douglas (1992). "Gift of the Holy Ghost". In Ludlow, Daniel H. Encyclopedia of Mormonism. New York: Macmillan Publishing. pp. 543–544. ISBN 0-02-879602-0. OCLC 24502140.